Instruction set extensions are a small number of custom instructions specifically designed to accelerate the processing of a given kind of workload such as multimedia or cryptography. 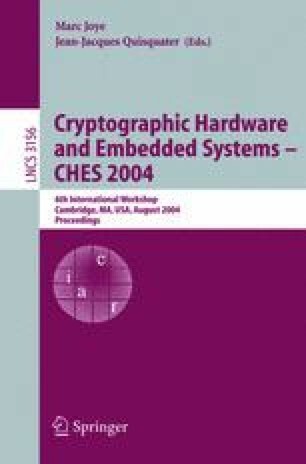 Enhancing a general-purpose RISC processor with a few application-specific instructions to facilitate the inner loop operations of public-key cryptosystems can result in a significant performance gain. In this paper we introduce a set of five custom instructions to accelerate arithmetic operations in finite fields GF(p) and GF(2 m ). The custom instructions can be easily integrated into a standard RISC architecture like MIPS32 and require only little extra hardware. Our experimental results show that an extended MIPS32 core is able to perform an elliptic curve scalar multiplication over a 192-bit prime field in 36 msec, assuming a clock speed of 33 MHz. An elliptic curve scalar multiplication over the binary field GF(2191) takes only 21 msec, which is approximately six times faster than a software implementation on a standard MIPS32 processor.